There are oft quoted harbingers signalling the arrival of spring. Lambs gambolling in the fields, pretty flowers brightening the garden, the sound of lawn mowers once again being put to work, the accompanying onset of hay fever and many others. Pictured from left to right at Barrow Chapter are; Gary Rogerson, Chris Butterfield, David Ingham, Mick Lacey, Richard Wilcock and Dave Dryden. At the top of the Province in the Furness and South Lakeland Group however, another sure sign of the changing of the seasons is a plethora of chapter installations with three occurring in the space of a week. The first of these was the installation meeting of Barrow Chapter No 3928. Formed in 1925 the chapter meets at Barrow-in-Furness Masonic Hall. Outgoing first principal Dave Dryden welcomed local Assistant to the Provincial Grand Principals Chris Butterfield to the meeting as the principal guest. Also in attendance, was Past Second Provincial Grand Principal Chris Band, Past AtoPrGPs David Grainger and another current AtoPrGPs in the person of Mike Threlfall. Vice chairman Gary Rogerson represented the group at this meeting as well as the two following Royal Arch installations along with group secretary Alan Pattinson. The ceremony proved to be an excellent one setting the standard for the others to match. Mick Lacey MBE, David Ingham and Richard Wilcock were maiden occupants of the chairs of first, second and third principal respectively. To mark the occasion Chris was presented with a cheque for £500 in favour of the Masonic Charitable Foundation 2021 Festival. Following the formalities 65 members and their guests enjoyed an installation banquet in the Fairfield Suite of the hall. Pictured from left to right at Grange Chapter are; Peter Pemberton, Chris Butterfield, Norman Thompson, Rowly Saunders, Barry Jameson, Tony Cassells, John Martin, Barrie Crossley, Alan Telford, David Grainger, Chris Band, David Ozanne, Alan Jones, Andrew Bartlett, Gary Rogerson and Chris Larder. The following day the setting moved 25 miles along the Furness peninsula for the meeting of Grange Chapter No 1715 which was formed in 1931. The bijou Grange Masonic Hall was pleasantly full to welcome Second Provincial Grand Principal Barry Jameson as the principal guest. Barry was in the company of one of his predecessors in that role in the person of Chris Band along with the former Grand Superintendent of Cumberland and Westmorland Norman Thompson. Chris Butterfield was again in attendance along with his forerunner David Grainger. Fellow grand officers Rowley Saunders, Alan Jones and Barrie Crossley were also present. Acting Provincial officers Tony Cassells, Andrew Bartlett, Peter Pemberton and Chris Larder added more splendour to the entry and exit processions. 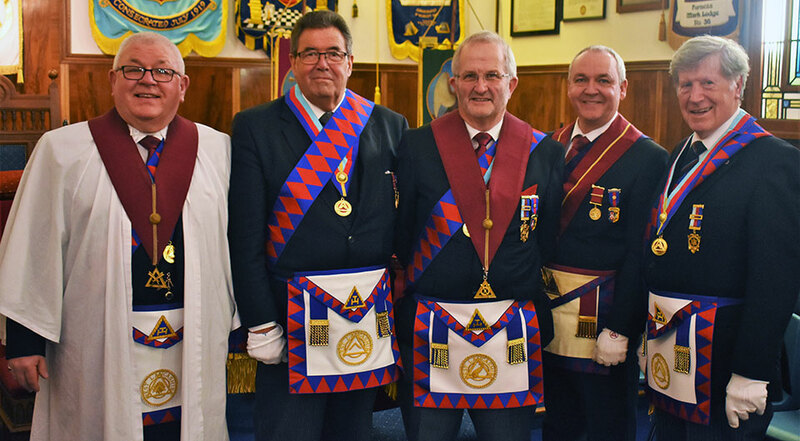 The ceremonial work stood comparison with the standard set by Barrow Chapter with installing first principal David Ozanne leading by example as he installed Alan Telford as first principal. In turn Alan installed Chris Band in his stead as second principal with Chris then placing John Martin in the third chair. Both Alan and John are new to these roles. Adding a personal touch to proceedings the robe address to first principal Alan was orated by his father John. The installation banquet, the menu being chicken in mushroom sauce, was held in the hall and was very well received. Seven days after the Barrow Chapter meeting it was back to Fairfield Lane in Barrow-in-Furness for the meeting of Henry Cook Chapter No 1021. The chapter was founded in 1888. Pictured from left to right at Henry Cook Chapter are; Chris Gray, Tony Hall, Scott Deakin, Gary Rogerson, Stuart Dickinson and Barrie Bray. The principal guest on this occasion was Tony Hall an Assistant to the Provincial Grand Principals. Acting officers Peter Pemberton, Andrew Bartlett and Tony Cassells once again offered their support and were joined by Phil Preston and John Browne. Once again the ritual was of the highest order. Installing first principal Stuart Dickinson has enjoyed a superb year in office and has proved to be an excellent ambassador for the chapter. He capped his term in office off in good style as he installed Scott Deakin in the principal chair of the chapter. Scott performed equally admirably in placing Chris Gray in the chair he had just vacated whilst Chris in turn positioned Barrie Bray in the seat of third principal. Like their counterparts of Barrow Chapter all three are fresh to the roles they now hold. The chapter scribe Ezra Harry Chatfield took obvious pride in delivering the address to the principals with his son-in-law being the newly installed first principal. It was somewhat fitting that the final address of this latest round of chapter installation was left in the hands of Tony Hall who orated the address to the companions in a wonderful manner. It proved a fitting finale to the work which had been enjoyed not only on the evening but over the course of the three meetings with a number of companions having been present at all of them. The MCF 2021 Festival once again benefitted from a charitable donation as Tony was presented with a cheque for £500. This latest donation entitles Henry Cook Chapter to style itself a Patron of the Festival and group charity steward, and the new third principal of Barrow Chapter, Richard Wilcock was on hand to present a certificate confirming this fact. Following the formalities, it was once again time to retire to the Fairfield Suite where 72 members and their guest enjoyed good food and company. Thus ‘Chapterfest’ 2019 was brought to an end. It was pleasing that all three meetings experienced good attendance, that money was raised for, and given to, worthy causes, that good company was enjoyed and that an abundance of excellent ritual was observed. However perhaps the most gratifying aspect of the meetings is that of the nine principals installed in the chairs of the chapters eight were in fact new to their roles with only one being a re-cycled past principal. That augurs well for the future of Royal Arch Masonry in the Furness and South Lakeland Group. Pictured from left to right at Henry Cook Chapter are; Harry Chatfield, Ken Boon, DC Dennis Laird, ADC Graham Benson and treasurer Wilf Proctor.